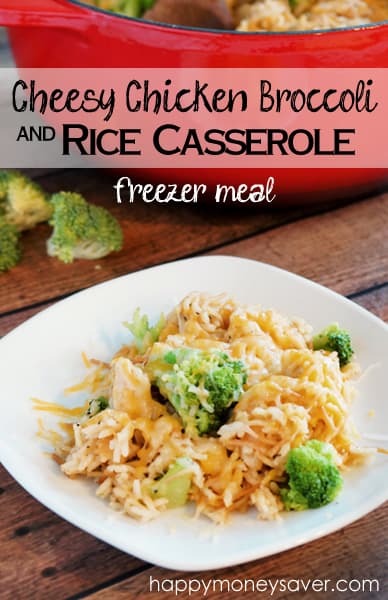 I don’t know about you, but I think cheese and broccoli are one of the yummiest combinations out there…in soup, on baked potatoes and especially THIS casserole!! 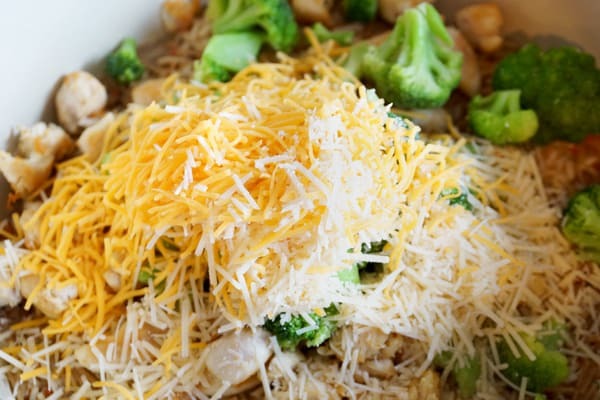 You are going to love this cheesy chicken broccoli rice casserole! 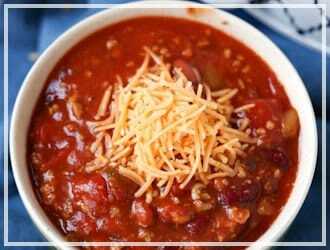 It’s delicious and made all in one pot, I love easy dinners like that, I’m all for less dishes to wash! 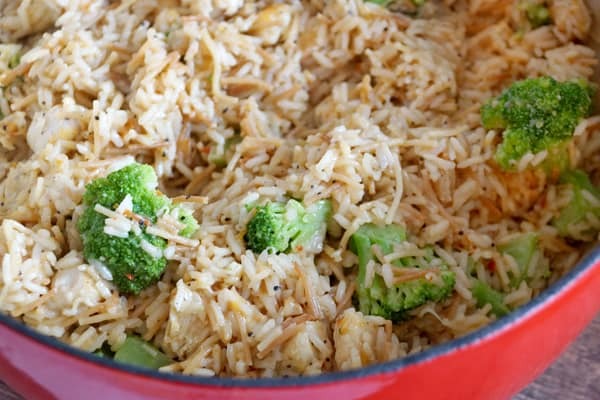 We have this meal on a regular basis and everyone love it, my kids even eat the broccoli! 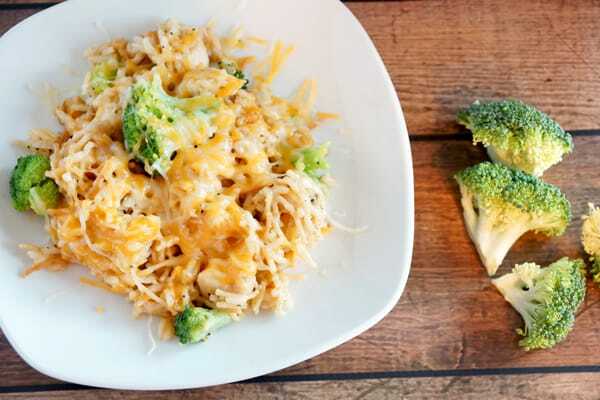 Who doesn’t love broccoli and cheese?? 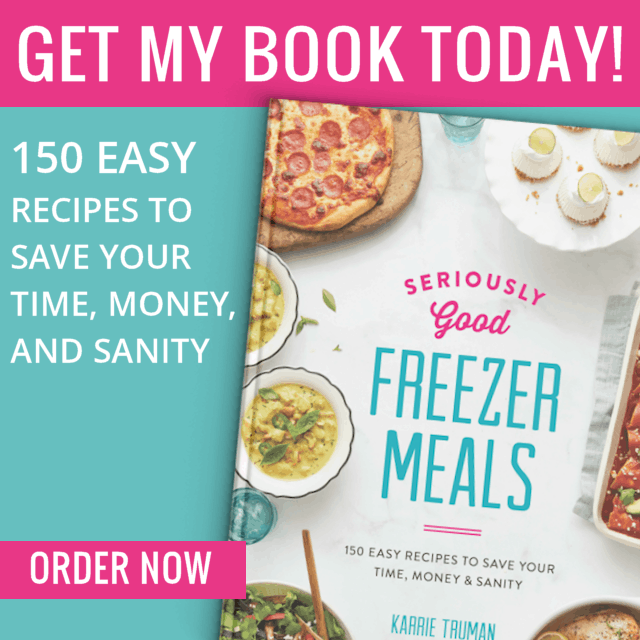 If it’s you, I’m going to change your mind with this recipe! In a large oven-safe pot (or skillet) over medium-high heat, add olive oil. Saute the chicken pieces until they are cooked all the way through and browned. Remove the chicken from the pan and set aside for later. In the same pot, over medium-high heat, melt 4 tablespoons of butter and add the broken up angel hair pasta. Stir it around frequently, cooking for about 3 minutes, the pasta should be golden brown. Add the rice and all of the seasonings to the pot and mix well. Next, add the the water and stock to the pot and bring to a boil over high heat. Once boiling, reduce the heat to low, cover, and simmer for 20 minutes. If you still have some liquid in the pot after the 20 minutes, that’s ok, it will absorb while it’s baking. 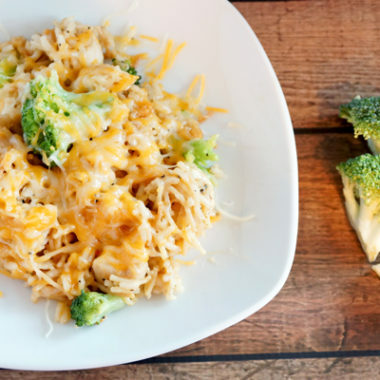 Remove the lid and stir in the cooked chicken pieces, both cheeses, and broccoli…reserve 2 tablespoons of cheese for topping at the end, if desired. It looks so good already! Cover again and bake in the oven for 2o minutes. Once it’s finished baking, remove the lid, sprinkle with the remaining cheese and serve! 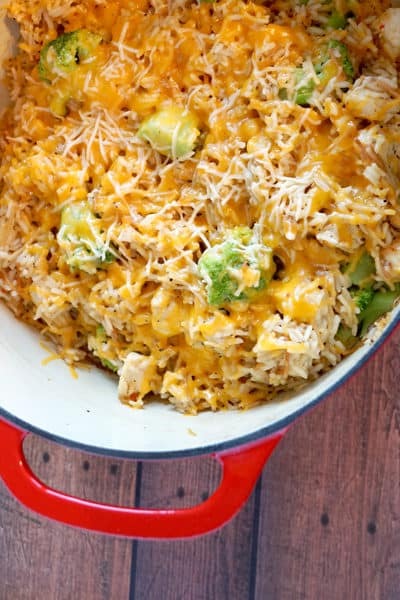 I really hope you enjoy this cheesy chicken broccoli rice casserole as much as I do! This is my kind of comfort food right here! In the 1 gallon bag, add the rice, Italian dressing mix, paprika, salt and pepper. Wrap the 4 Tablespoons of butter in the plastic wrap and place in the gallon bag. 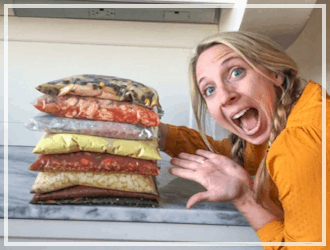 In the snack size bag, seal your broken angel hair pasta and place that bag inside the gallon bag. In one of the quart bags, add the cubed chicken pieces (raw), seal well, and place inside the gallon bag. 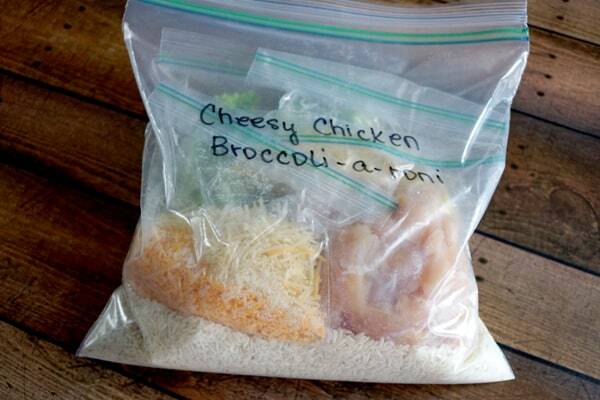 In the other quart bag, add both cheeses and broccoli. Seal well, and place inside the gallon bag. 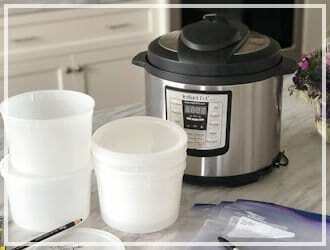 Label and seal the gallon bag and freeze. It will look like this…I just love it, the perfect packaged meal. To thaw, place the packet in fridge over night. 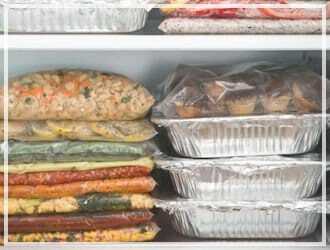 You can remove the chicken and cheese bags and just put them in the fridge and leave the rice and pasta on the counter if desired, to save space. 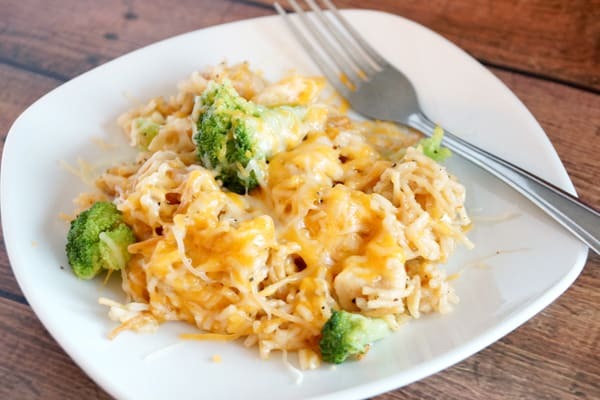 This cheesy chicken broccoli rice casserole is the perfect busy night meal! 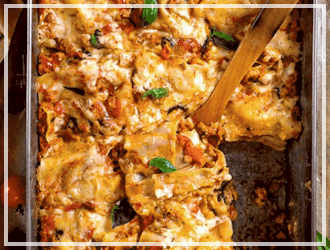 So easy to throw together and have dinner on the table in no-time! 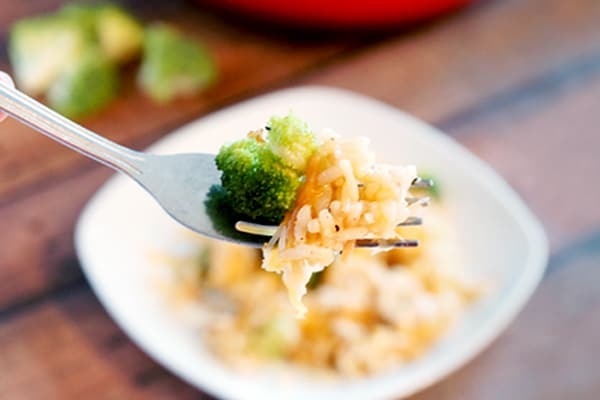 Cheesy Chicken Broccoli Rice Casserole is perfect for a healthy and easy dinners. It’s delicious! 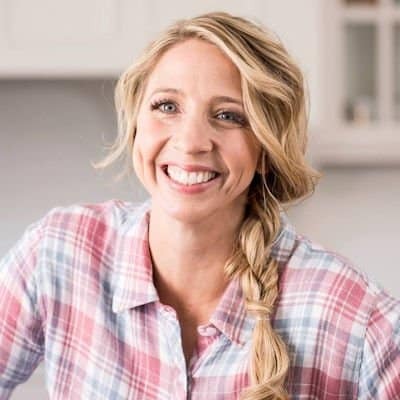 In a large oven-safe pot or skillet, over med-hi heat, add olive oil, and saute chicken until browned and cooked through, remove from pan, set aside. In same pan, over med-hi heat, melt 4 Tbsp. of butter, add angel hair pieces. Stir frequently, cook for about 3 minutes, or until all the pasta is golden brown. Add rice and seasonings, mix well. 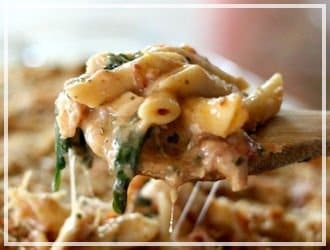 Remove lid and quickly stir in cooked chicken pieces, and both cheeses and broccoli, reserving 2 Tbsp of the cheese for a topping after baking, if desired. Cover with lid, and bake at 350 degrees for 20 more minutes. Remove from oven, remove lid, sprinkle with remaining cheese, and serve. 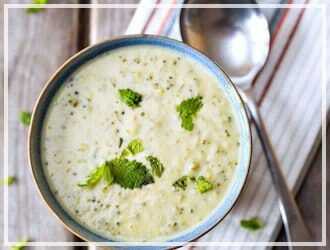 Note: You may substitute any vegetable you like, peas are also very tasty in this recipe. 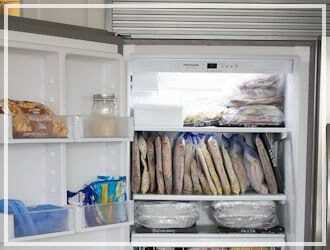 Freezer Instructions: You will need 1 Gallon Freezer Bag, 2 Quart Freezer Bags, 1 Snack Size Bag, and Plastic Wrap. In the 1 gallon bag, add rice, italian dressing mix, paprika, salt, and pepper. Wrap 4 Tbsp. butter in plastic wrap and place in bag (if desired). In a snack size bag seal your broken angel hair pasta, place inside gallon bag. In 1 of the quart freezer bags put cubed chicken pieces, seal well, place inside gallon bag. In the other 1 quart freezer bag put cheeses and broccoli. Seal well, place inside gallon bag. Label and seal your gallon bag. Freeze. 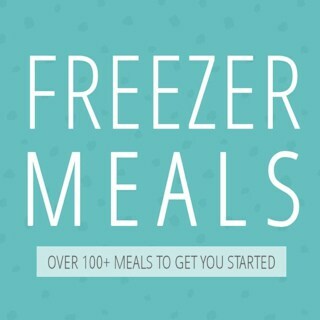 –>See tons more of my freezer meals here. Has anyone tried making this and freezing it? Can you bake this is casserole dish then put in freezer to reheat later in month? That’s a good question and I would prefer that method also. I am going to try it for myself. Anyone find out the answer to this question? Can you make this as is and then freeze it? Hi! 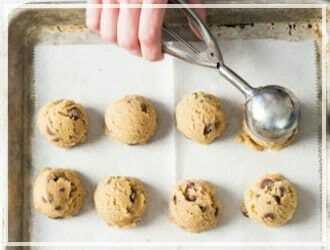 You can, however trying to bake it a second time might make it a bit dry. 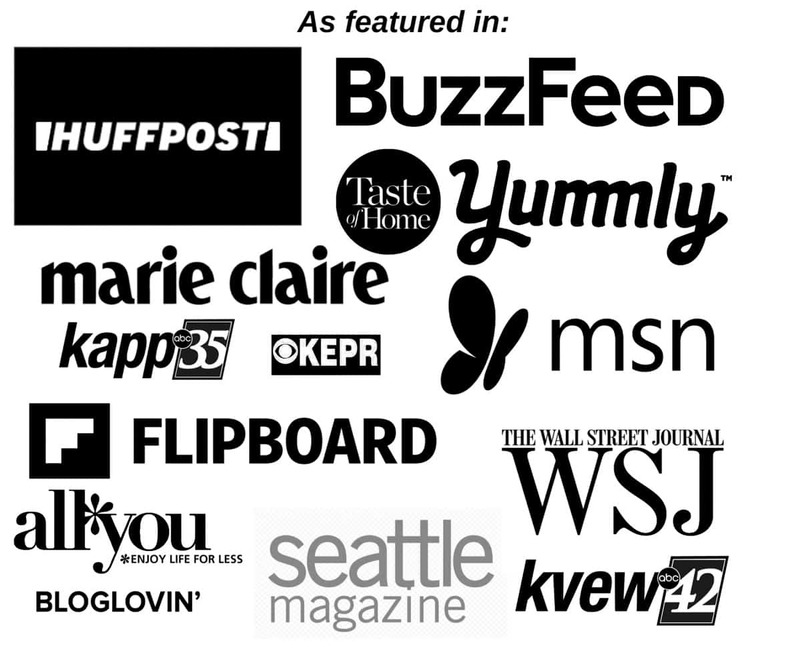 I wonder if this would go well with brown rice, or maybe quinoa? I try to stay away from high glycemic foods, like white rice. Should I correct the amount of rice if using brown rice? This goes beautifully with brown rice! I made it for dinner yesterday with brown rice. I increased the water/broth to 4 cups. 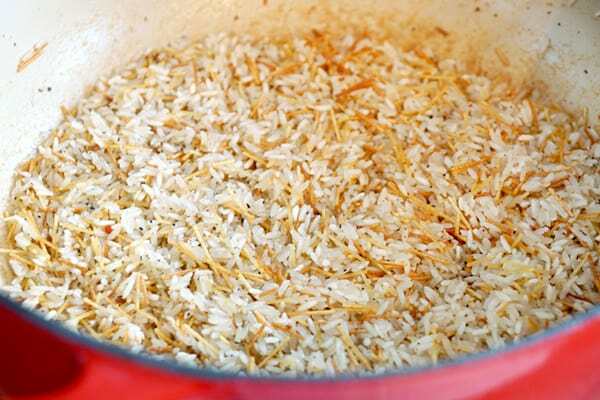 You will also need to increase cooking time for the rice to an hour. I also wanted it to bake in the oven longer rather than on the stove top, so I threw all the ingredients into the pan (after sauteeing the chicken and pasta/rice separately) and baked it for an hour. Delish!